The Himalayas are the highest and one of the most exciting mountain ranges of the world. From trekking to rafting to sightseeing to religious, the place offers many options for travelers. Stretching across Bhutan, India, China and Nepal, the snow capped mountain peaks offer a treasure house of experiences for the travelers. As the snow capping the peaks of Himalayan mountains start to melt in spring, they become raging torrents of water crashing down on the rocks that block them, thus creating an unforgettable Himalayan experience- White water rafting. Most of the rafters choose to experience it at Rishikesh in Ganges River though there are various others flowing through these mountains. For those looking for a more serious rafting adventure, there is the Zanskar River snaking through Northern India that has the recommended waters for the experts. For those looking for some eco- adventure excursions, mountain biking, eco safaris, hiking, rock climbing and rappelling along with some good old camping fun is the best option. The Himalayan trails pass through various time zones, thus offering the bicyclists an opportunity to see different types of floras and faunas in addition to enjoying the beautiful mountain scenery and a chance to visit some popular religious sites that dot the mountains. Some of you who like a simpler eco vacation, there are camping opportunities, done under the guidance of an expert, with rustic accommodations and small lanterns that do the work of what electricity does in normal day to day life. However, Himalayas are not just about adventure tourism. It is also one of the top spa destinations of the world. Combining the best of international wellness experiences with traditional Indian wellness regimes of yoga, ayurveda and Vedanta, there is the Viceregal Palace, also known as the Ananda Spa that is considered to be the ultimate statement of subtle style. 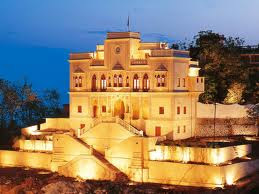 Once the place played host to some of the biggest heads of the state during the Maharaja times. Now completely restored to its ancient splendor complete with modern luxuries, the place plays ideal host to the biggest international names who come to enjoy luxury and peace at its best. Remember this, Himalayas are more than just a physical experience. The place is rich with diverse flora and fauna, spectacular views, religious and peaceful monasteries perched on top of the hills, thrilling adventurous flowing waters, friendly locals and a rich and mysterious culture. All these add up to make your Himalayan tour a unique and unrivaled experience.